For mild to moderate cognitive disabilities. For mild to moderate cognitive disabilities. Assembling the Mocko Jumbi Man requires close attention to direction, size and color while learning a new sequence of actions. Gecko introduces tension and twisting problems with lacing, while Iguana provides complex cues hidden within layers of beads. 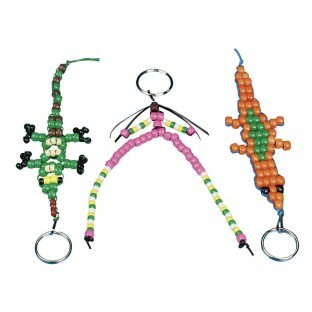 Includes plastic lace, key rings, lanyard hooks, plastic beads, and diagrams of design to make 100 projects. Level 3.0-4.8.